Save on Covers at Joe Heman. Top brands include Spring Fever. & Spring Fever. Hurry! Limited time offers. Offers valid only while supplies last. 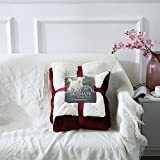 Spring fever Luxury Elegant Sherpa Cover Blanket Solid Durable and Cozy Warm for Bed/Couch/Sofa - Claret 80" x 90"
View more products in Vacuum Parts & Accessories. © 2019 - joeheman.com. All Rights Reserved.